LONDON: Britain's grand welcome for Saudi Crown Prince Mohammed bin Salman will begin on Wednesday with a lunch with Queen Elizabeth, as the two countries seek to widen longstanding defence ties into a far-reaching partnership. But as Prince Mohammed and Prime Minister Theresa May meet, demonstrators will protest both countries' roles in Yemen where war has killed an estimated 10,000 people and where 8.3 million people depend on food aid and 400,000 children have life-threatening levels of malnutrition. Inside May's Downing Street offices the two leaders will launch a "UK-Saudi Strategic Partnership Council" - an initiative to encourage Saudi Arabia's economic reforms and foster more cooperation on issues such as education and culture, as well as defence and security. Business deals are possible with British defence group BAE Systems <BAES.L> and European weapons maker MBDA, and initial agreements could be concluded on gas exploration, petrochemicals and other industries, according to British and Saudi sources. May intends to use the private dinner at Chequers, a 16th-century manor house 40 miles (60 km) northwest of London, to bring up concerns over the humanitarian crisis in Yemen, her spokesman said. Protestors are planning to target the Saudi officials over Yemen and other human rights issues, and Britain for licensing 4.6 billion pounds of weapons sales to Saudi Arabia since 2015. 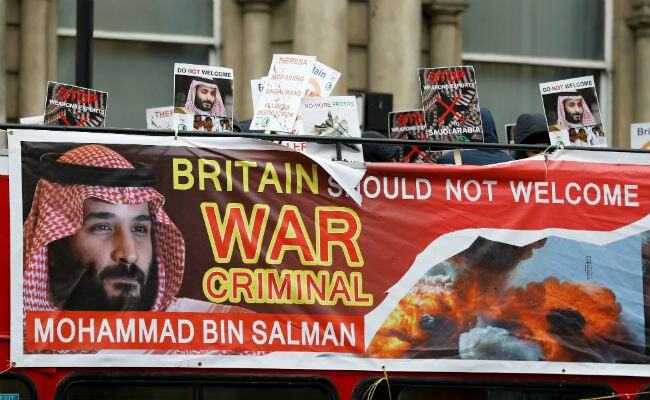 Buses have spent two days touring London with banners accusing Prince Mohammed of war crimes, with more planned for Wednesday ahead of the main rally. "It is vital that people show up to the protest tomorrow outside Downing Street to make clear that the UK government's complicity in the war on Yemen is not supported by the public and that we demand a peaceful and humane foreign policy," said Lindsey German of the Stop the War Coalition.